If you are looking for is small and convenient way to keep your smartphone or mobile devices charged whilst away from the grid, a new pocket battery charger device called the Megalo Mini might be worth more investigation. Considering its size the Megalo Mini, it’s equipped with a powerful 1400 mAh battery that contains enough juice to keep your smartphone powered throughout the day. Check out the video after the jump to learn more about the pocket battery charger from its creators. The Megalo Mini project is currently over on the Kickstarter crowd funding website looking to raise enough pledges to make the jump from concept to production. Michael Krikheli and Jeff Macks the inventors of the Megalo Mini explain a little more about their inspiration and the design of the pocket battery charger. “Megalo Mini is a functional and straight-forward portable charger designed with the user in mind. 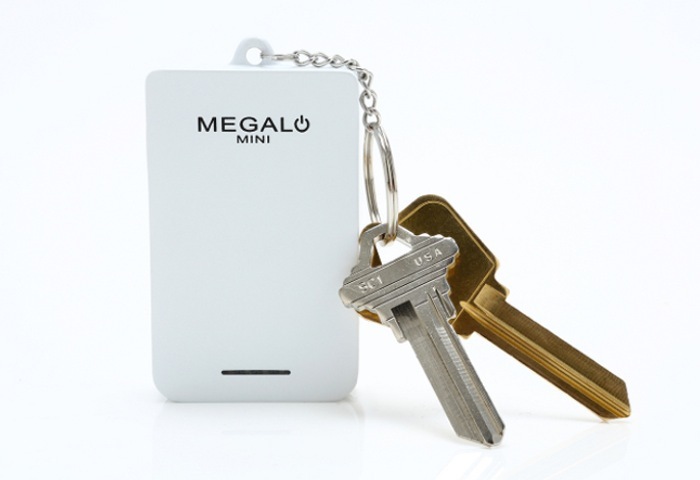 Equipped with the capacity to recharge your iPhone 5 up to 75% and your Android phone up to 100%, depending on the model, Megalo Mini is very small, ultra-light and can be easily attached to your keychain. The soft matte surface and sleek design of Megalo Mini allow you to safely place the charger together with your phone in your pocket without the risk of scratching the touchscreen. In addition, Megalo Mini comes with the cables built in, making it even more compact. So if you think Megalo Mini pocket battery charger is something you could benefit from, visit the Kickstarter website now to make a pledge and help Megalo Mini become a reality.